Thanks to NJIT’s partnership with BRAID (Building, Recruiting, And Inclusion for Diversity) initiative, co-led by AnitaB.org and Harvey Mudd College, we have worked with Dr. Geller (Associate Dean for Research, YWCC) to allocate funds from BRAID scholarships to sponsor undergraduate girls from NJIT to attend the Grace Hopper Conference. Grace Hopper has been a massive success for me. I have secured two summer internships by speaking to and interviewing with recruiters at the conference’s Career Expo. Thanks to these internship opportunities, I’m developing my career in data science as I get to work on real-world data science projects. This past summer I interned with New York Life Investment Management in Jersey City, NJ as a data solutions developer, where I worked on a client retention model for the company’s mutual funds. For the first time in my life I was able to get my hands dirty in real-world data. I also had the opportunity to learn R, a statistical programming language critical for a data science career, during the summer. I was able to extend my internship into the fall and intern with New York Life Insurance Company, where I collaborated with the data science team and the underwriting team to develop a comprehensive cause-of-death rule system. Working while attending school full-time was quite an unforgettable experience—my time management skills are now sharper than ever. Looking back at where my career and my skill set was before this past summer, I feel that I’ve come so far from where I was just last year, and this is all thanks to the Grace Hopper Conference. Before starting college, I was a total stranger to the world of computer science. during my freshman year, I felt really lost because of the all the new information I had to learn. However, I was also really excited about the opportunities this field had to offer. After attending Grace Hopper for the first time in Fall 2017, I not only gained confidence, but also secured an internship position. Since the conference is a celebration for women, I was able to see, listen to and learn from incredible women who were all working for their passions. Using that motivation, I was able to put aside any previous apprehensions and allowed myself to approach various employers and take full advantage of all the opportunities Grace Hopper had to offer. This summer, I will be an IT intern at Travelers Insurance in Hartford, CT. This particular program allows interns to explore a range of concentrations which is important for a beginner in the field. I will forever be grateful to Grace Hopper for giving me the chance to build my career and my confidence. When I was given the opportunity to attend the Grace Hopper Celebration last October I was very excited, but nothing can prepare you for the excitement that you feel during the conference. Being in a room with over 10,000 women dedicated to building a strong and supportive community was almost indescribable because of the incredible energy. Listening to keynote speakers such as Melinda Gates and networking with inspiring women in technology was such an eye-opening and enriching experience. The atmosphere of the conference and being surrounded by such positive energy was empowering. I am very thankful that I was able to have those experiences because it gave me the confidence and positive energy to chase my ambitions. Grace Hopper helped to feel confident in all areas of career development, such as networking, interviewing, and clarifying my career path. Due to the career fair portion of the conference, I ended up with several offers from different companies, which seemed unimaginable to me. This summer, I will be interning at Deutsche Bank on Wall St as a software engineer. That is such a dream come true to me because I will be getting hands-on experience in the tech field while learning from successful professionals. When I reflect back on all of my accomplishments last semester in career development, leadership, and academics, I can trace much of it back to my experiences at Grace Hopper. Being a member of such an empowering community of women in tech has helped me to grow in so many areas and I am so thankful for the unforgettable opportunity. I am glad that I got the chance to attend Grace Hopper Conference (GHC) last year. I learned a lot about various types of careers one can pursue in technology and how important technology is in corporate world. Through the workshops and tech-talks at GHC, I gained insight into how to approach behavioral and technical interviews, and also how to prepare before/during hackathons. The career fair allowed me to interact with various recruiters and learn about their stories of why they chose a career in technology. I am looking forward to attend next Grace Hopper Conference. The Grace Hopper Celebration has been an amazing conference experience for me, both times that I attended. The first time I attended I had little to no experience, and was overwhelmed by the support from other women, inspirational keynotes, phenomenal workshops, and unexplainable career expo. I was able to interview at various companies such as workday, adp, prudential, cisco, and USAA both years and was able to network with amazing and likeminded women. Last summer I interned at a start up that I indirectly met through Grace Hopper. This year I will be interning at USAA. Every year I look forward to expanding my knowledge and skills through workshops, interviewing, and meeting other women in computing. I wouldn't miss this experience for the world. 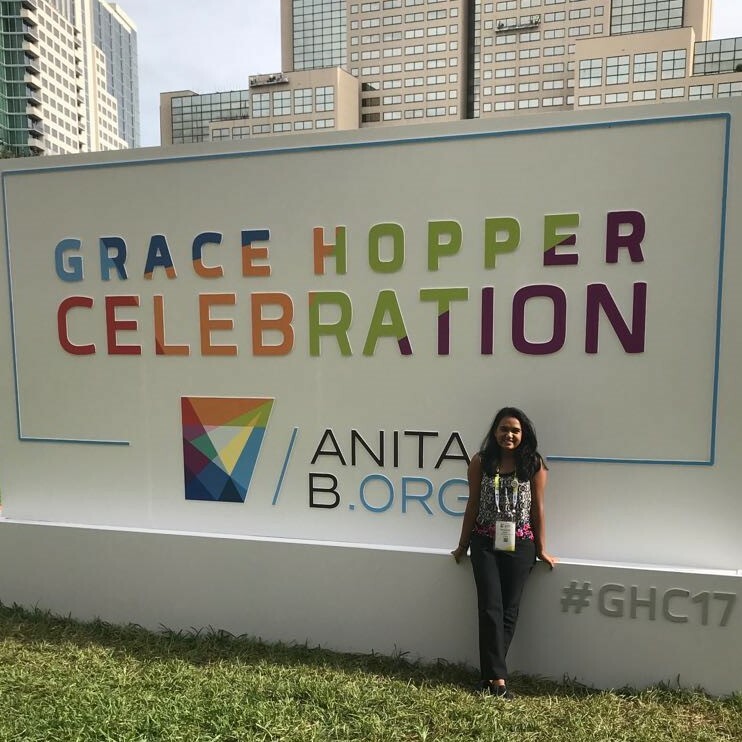 I attended the Grace Hopper Conference for the first time in 2017 and it was a tremendous experience. It was so exciting to be surrounded by thousands of women who shared the same passion for the world of computing. I attended several workshop sessions run by diverse groups of people which definitely broadened my perspective. The Career Expo gave me the chance to meet with many companies from all over the country and even interview with a few. Prior to attending GHC I was extremely nervous about interviews and internships and was not confident in my skills. However, the atmosphere of the conference was so encouraging and reassuring that I put my best foot forward. I'm happy to say that I received offers from both companies that I interviewed with during the conference. I will be a intern with Bank of America in Pennington, New Jersey in the Summer of 2018 and I am so excited to begin my career with this amazing opportunity. I'm really grateful to have gotten the chance to attend GHC and I look forward to next year's conference! I have been to GHC twice in college career and I can only think of positive things to say. It was the best experience in my life as a woman in computing. Before this convention I was on the fence of switching my major out of Computer Science, but after attending the conference and listening to so many successful women present on their journey and struggles makes me want to pursuing as Computer Science major. I want to prove to them that their hard work is paying of and women are changing the world. This convention was nothing but a positive experience. As a sophomore, I had six summer internship offers lined up with the help of Grace Hopper. As a junior, I have three more summer internship offers. My one piece of advice for future attendee is to schedule interview with the bigger companies later in the convention because prior interviews help you prep for them. I would also recommend them to go into the Career Fair with a list of companies you would like to visit and DO NOT wait in any line. If there is a line, leave and go another company on your list. As for my internship in the Summer of 2017 with Bank of America as part of the Global Technology Summer Analyst Program with Global Banking & Markets Technology, I was able to work alongside other developers both novice and advance. My projects included working with python, Tableau, and Cognos. Apart of learning these new skills, I was able to also develop on my communication skills while networking with a wide range of employees and as well as other interns. Internships are of definite value for professional development because you are able to apply the theoretical concepts you learned in class to real life projects that can or will be implemented into the company. It is also a great learning experience not only professionally but in working with teams and getting situated in a completely new living environment if you were to be relocated. I have been lucky enough to attend the Grace Hopper Conference the past two years. In 2016 I was able attend for the first time through a scholarship I received from Microsoft. it was truly an eye opening experience to see around 15,000 women in the field of technology surrounding me. These phenomenal women were there to present their research, talk about their experiences, and teach about new technology. It was very inspiring to see how successful some of them were and to hear people like Ginni Rometty and Melinda Gates talk about their experiences. Being in such a supportive and inspiring atmosphere is a motivation for many young girls trying to leave a mark in the field. Through the large career expo at the celebration, I was able to land a few internships offers as a Sophomore and Junior. Last summer, I interned at American Express as a Software Engineer in New York City. I was able to work on a project that provided me the opportunity to learn about Restful API’s, MongoDB, SQL, and Slack API. It was nice to work in a real world environment and learn skills that I might not be able to learn in a classroom. I will be interning at JP Morgan and Chase in the Summer of 2018 as a Technology Analyst and am excited to start working!